Auryn Resources is a technically driven junior mining exploration company focused on delivering shareholder value through project acquisition and development. The Company's management team is highly experienced with an impressive track record of success and has assembled an extensive technical team as well as a premier gold exploration portfolio. 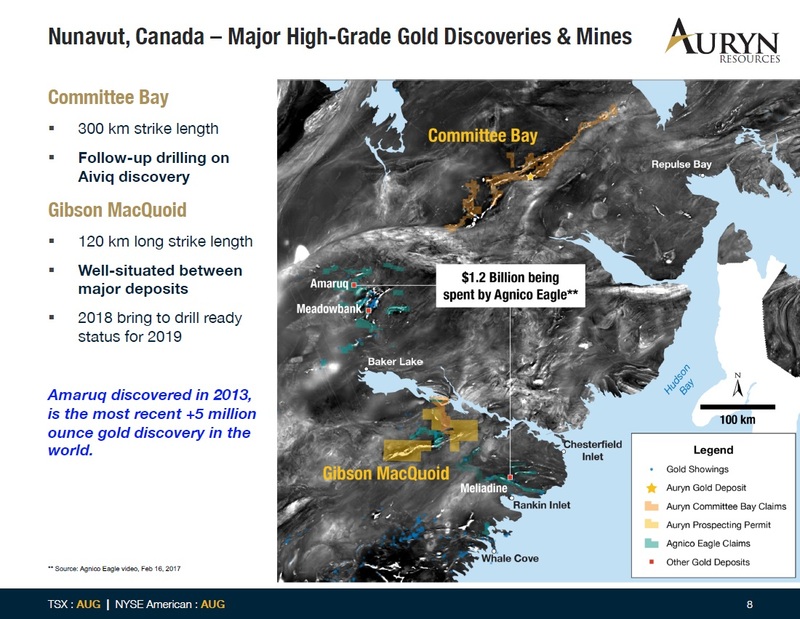 Auryn is focused on scalable high-grade gold deposits in established mining jurisdictions, which include the Committee Bay and Gibson MacQuoid gold projects located in Nunavut, the Homestake Ridge gold project in British Columbia and a portfolio of gold projects in southern Peru. The Sombrero Project consists of the Sombrero North and Sombrero South properties, totaling approximately 116,800 hectares and located about 340 kilometers SE of Lima in southern Peru. The properties are hosted in the Andahuaylas-Yauri belt. The best surface results Auryn's technical team has seen at the project have been in Trench 18, with 30 meters of 1.93% CuEq, 24 meters of 0.73% CuEq and 54 meters of 0.34% CuEq. 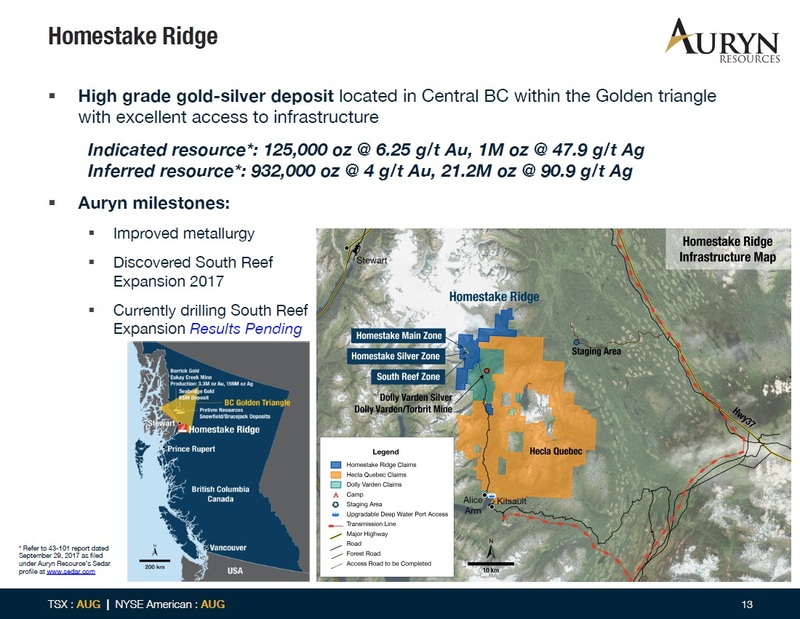 On September 25, 2015, Auryn Resources Inc. acquired a 100% interest in the Committee Bay gold project which includes over 390,000 hectares situated along the Committee Bay Greenstone Belt (CBGB). 3,500 meters of RAB drilling on high-resolution gold-in-till targets at Kalulik, Aarluk, Ridge, and Castle. 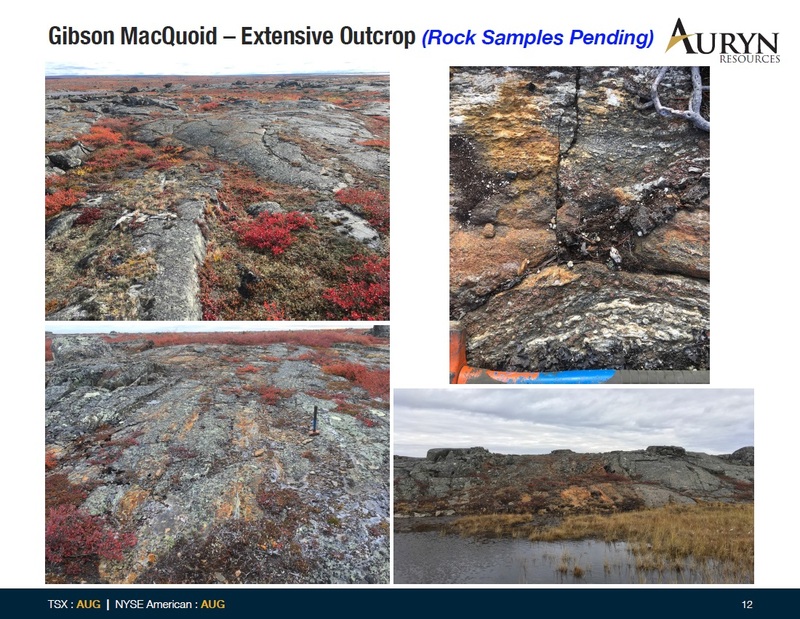 Auryn has acquired prospecting permits along the Gibson MacQuoid greenstone belt located in Nunavut, Canada. These permits are located between the Meliadine deposit and Meadowbank mine. The 19 prospecting permits encompass approximately 120 km of strike length of the prospective greenstone belt and total 329,000 hectares collectively. 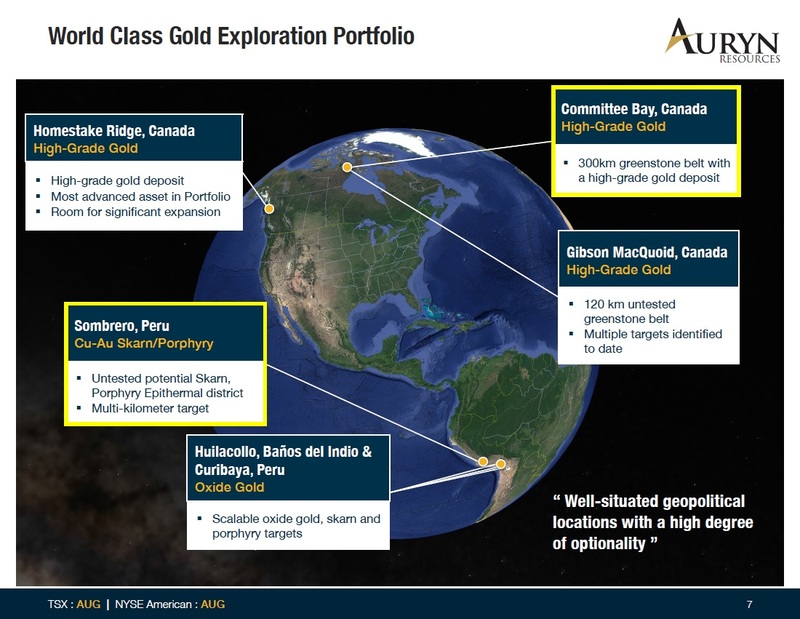 Auryn's technical group has refined its till sampling approach and is very encouraged by the 8 gold-in-till anomalies discovered on the project to date. The Huilacollo epithermal property is comprised of 3300 hectares of intense hydrothermal alteration. Contiguous to the Huilacollo property are the Tacora and Andamarca properties, which the Company acquired in August 2017. The Baños del Indio epithermal property is comprised of 5,000 hectares of well-developed high-level steam heated epithermal style alteration and is considered by Auryn to be one of the largest untested epithermal alteration centers in Peru. The Curibaya property comprises of 18,100 hectares covering the regional Incapuquio fault zone and subsidiary structures. Importantly the licenses host a number of cross structures to the Incapuquio fault zone that are considered highly prospective. Mr. Bebek has 20 years of experience in the mineral exploration industry. Mr. Bebek was formerly the President, CEO and cofounder of Cayden Resources Inc., and a co-founder of Keegan Resources Inc. (now Asanko Gold Inc.). Mr. Bebek is a cofounder, Co-Chairman and Director of Torq Resources Inc. and serves on the advisory board of Gold Standard Ventures Corp.
Over the past 25 years, Mr. Wallace has been instrumental in building numerous high-quality mineral exploration, development, and production stage companies including co-founding Cayden Resources Inc. Mr. Wallace is also a co-founder and Director of Asanko Gold Inc. and a co-founder, Co-Chairman and Director of Torq Resources Inc.
Mr. Henrichsen is a structural geologist who is leading the Auryn technical team. Previously he was the global structural geologist at Newmont. Mr. Rees has worked with Canadian and US publicly listed resource companies for the past 12 years. Mr. Rees is also the Chief Financial Officer of Stratton Resources Inc.
Mr. Starr has over 16 years of experience working for global investment banks and independent boutique investment dealers. He was a senior member of the management team and a director of Cayden Resources. 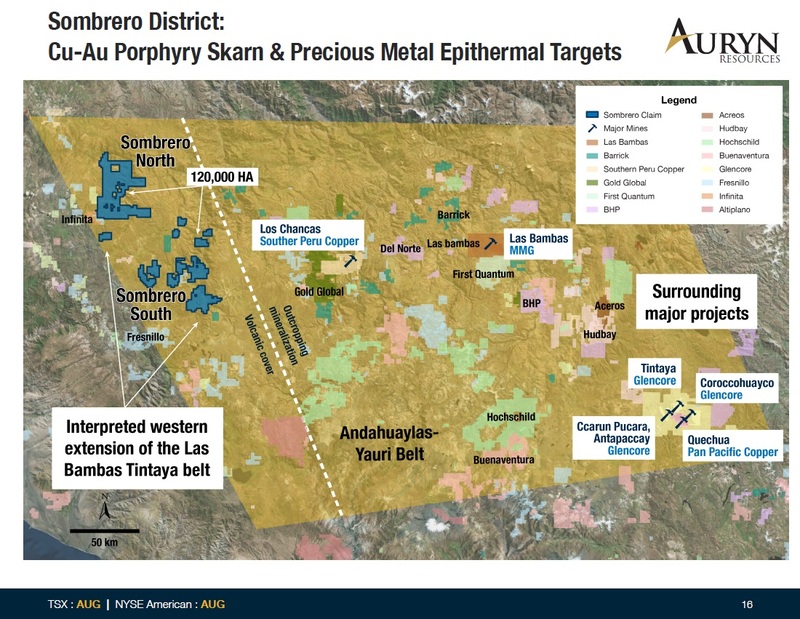 On November 26, 2018, Auryn Resources Inc. announced that it has identified multiple copper-gold drill targets at its Sombrero project. 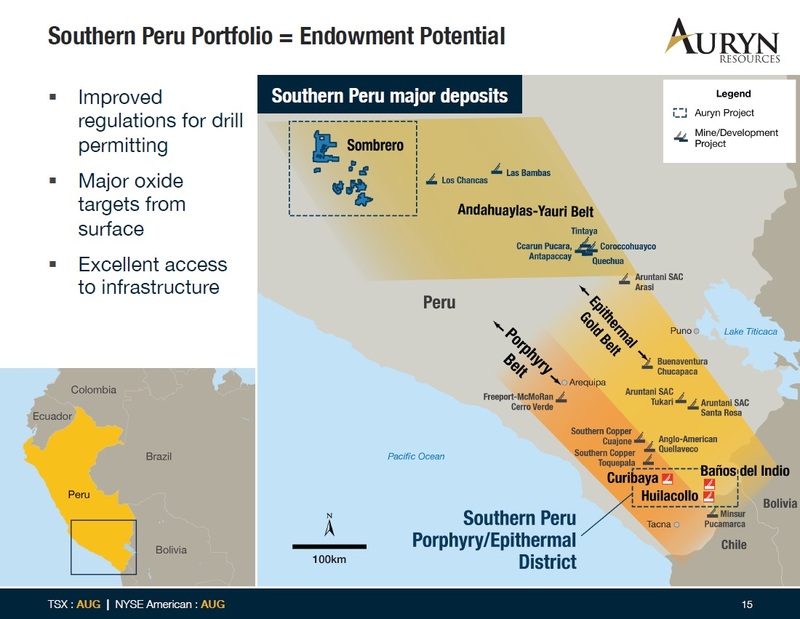 Auryn has identified several kilometre-scale targets under copper-gold surface mineralization at its Sombrero project in southern Peru. The targets identified tend to begin at surface and can continue to a depth of 600 metres, representing more than one substantial opportunity for skarn and porphyry mineralization. 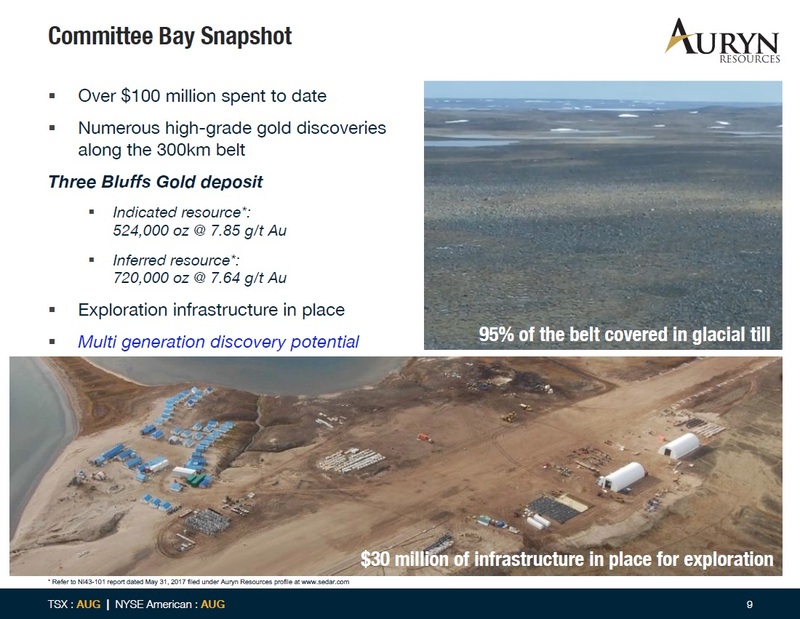 On November 13, 2018, Auryn Resources Inc. announced that it has drilled a 1.5-kilometre gold-bearing hydrothermal system at the Aiviq target at the Committee Bay gold project. A total of 16 diamond drill holes (4,996 metres) consistently intersected the target structure, with the best intercept being 13.5 metres of 1.54 grams per tonne gold (including six metres of 3.3 g/t gold) in hole 12 at the southwest margin of the drilling program, leaving the system open in that direction. Hole 12 also exhibited the most intense alteration and quartz veining along the system.